This article explains types of damage that occurs on various types of wood flooring in buildings. We illustrate buckling wood floors and comment on how they happen; we illustrate cupping of wood flooring and point out the diagnostic value of noticing which way the cup is shaped. We explain what to do about gaps between interior floor boards, and we also address deterioration and problems with outside wood decks and porch floors, and we also describe repair approaches for various wood floor damage. 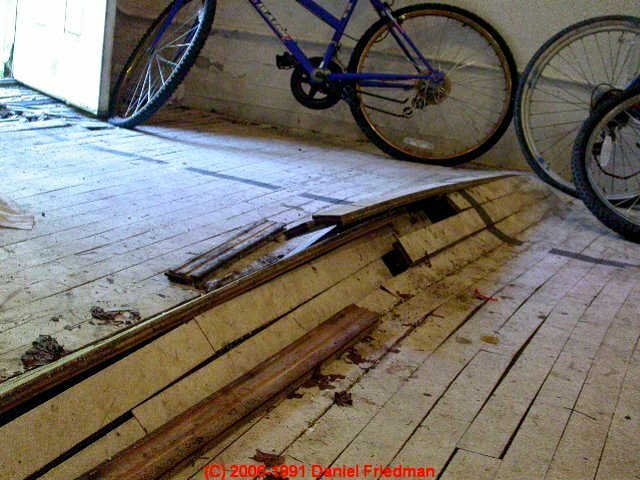 Our photo at page top shows cupped wooden strip flooring and an easy way to detect this condition.. This 1940's wood floor buckled severely because of wet conditions in a gymnasium after the roof leaked. But even if a building is not subjected to flooding or wet floors, if the wood floor was installed without adequate clearance around its perimeter buckling can occur when moisture increases in the building. And as we discuss at FLOOR, WOOD MOISTURE, a successful wood floor installation requires that the wood flooring be acclimatized and at proper moisture level in the building before it is installed. Very large wood floors (such as in this gym) may need an inch or even more of side clearance at the building walls - a detail accomplished by building out floor/wall baseboard trim if necessary, or in the case of newer products, by the combination of clearance gaps and a floating floor design. Compare our photo concave (curved down) cupped wooden floorboards with the convex (curved up) cupped floor boards in the photo at the top of this page. Diagnosing why a wooden floor has become cupped is an important step in correcting the problem, since we need to identify and correct the moisture source. There are exceptions, but in general a board swells on its side that is most moist. 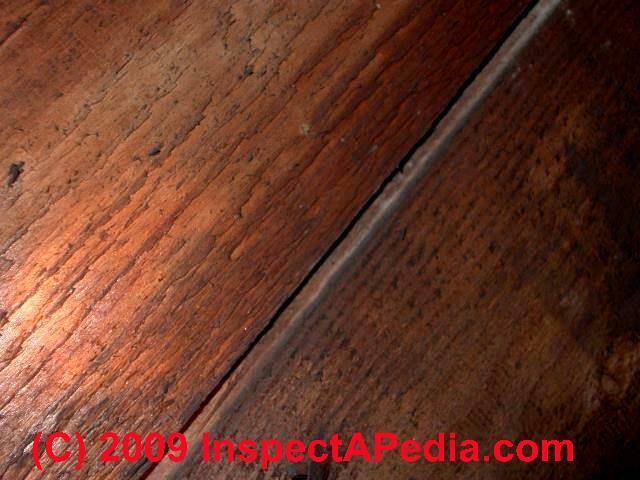 So on an interior floor like the one shown at left, the fact that the center of the floorboards is cupped "down" we infer that it is the down-side of these boards that is more moist than the finish side facing the room. We find this condition in homes with finished wood flooring installed over a damp or wet basement or crawl space. At our page top photo the finish floor boards seem to be cupped "up" - suggesting that this floor has been wet from above. If the floor board cupping is minor and hard to see, you might decide to just address the moisture problem and leave the floor alone. It won't recover, but it the floor should not get worse. How would we repair a badly cupped wooden floor? Sanding the floor flat is an option unless the boards have not only cupped but come loose from the subfloor. In that case floor replacement may be necessary. Indoors we find that floor boards tend to cup so that the concave side of the board is towards the floor's more dry side, and the convex side of the cupped or curved boards tend to be facing the floor's more wet side. Apparently when a wooden board has uneven moisture content across its thickness it will tend to expand more on its more wet side, causing that side to "arch" or become convex. You might think that outdoors where despite temporary wetting from rain, deck boards and wood step boards open to air on both sides ultimately have a uniform moisture content across the board's thickness. But because the upper board surface is exposed to sun and in some cases more wind or air movement, the under-side of boards may have a higher moisture content. In some installations, significantly higher. For an explanation of wood board cupping and which side of deck, ramp, and exterior stair boards should face "up". See BARK SIDE UP on DECKS & STEPS. Cupped ramp boards (or deck and platform boards) with the "cup" facing up will hold water and form algae or ice more quickly than boards that drain properly, increasing the risk of a slip, trip, or fall hazard. Upwards-cupped boards sometimes rot faster too . Look at the end-grain of any deck, ramp, or wooden walkway board and notice the curved lines that mark the winter wood layers of the tree from which the board was cut. If these lines arch "upwards" when the board is placed, most boards will also be curved upwards (convex) and will drain better. But before nailing a deck or ramp board in place, look at the board surface itself - sometimes the boards don't follow these "cupping rules", or the bark side of the board may be badly damaged - so when building a wood structure you may have a reason to place a few walking-surface boards "upside down". When building a deck we like to look at the end grain of the wood and install deck boards with the "bark side" up so that cupped boards won't form puddle-collecting dips on our deck. But look at your actual individual boards or stair treads when you are building an outdoor structure. If we are installing a deck board that is already rather cupped, we install it with the convex or "outward curve" side facing up for best drainage. Also see DECK & PORCH CONSTRUCTION. Watch out: On wooden decks and stair treads a defect "shelling" can occur with the bark side down method. Shelling is a term used by some builders to refer to the loss of portions of a board surface as late wood growth (the outer surface of the tree and thus the "bark side" of the board) separates from early wood growth (the inner portion of the tree or the tree-center side of the board). Shelling is reported to occur more often in lumber made from Douglas Fir and Southern Pine. When building an outdoor deck wooden stair tread, it is a good idea to avoid using boards with questionable, likely to separate, portions of their upper surface. at SHELLING DAMAGE TO WALKING SURFACES ON WOOD DECKS & STAIRS. Gaps between wood floorboards may occur for several reasons, but the common underlying cause is a moisture problem. Installing wood flooring before it has had an opportunity to acclimate to the indoor moisture level of its new home often means that too-moist flooring was nailed in place, later shrinking as building heat further dries the wood. The gap between the flooring shown at left is viewed from the under-side of the floor of an older building. This is a ship-lap joint whose boards have separated about 3/16". Gaps can also appear between sections of a wood parquet floor, as shown in our photo (left). Watch out: Do not rush to fill in gaps like this in wooden floors. Particularly in the case of wideboard flooring the width of individual boards increases and decreases seasonally as building indoor moisture levels increase (typically in the summer) or decrease (typically in winter). If you fill the gap between floor boards in the dry (wide gap) season, when the building moisture increases and boards swell the swelling floor boards will push against the gap filling material, actually crushing the edges of the floor board. Then when the building dries out again a new gap will appear. Or in extreme cases the floor may buckle in damp weather. In either case, it's better to just vacuum out the dust and debris and leave these wideboard floor gaps alone. At WOOD FLOOR TYPES where we illustrate a restored and re-finished wide-board floor in an 1860's home, if you click and enlarge the photo you'll see that we left the flooring gaps open. In fact during restoration we sometimes have to pick out putty or other stupid crack fillers that someone has applied earlier. A common complaint we've investigated is shrinkage gaps in wood flooring installed over radiant heat tubing. The underlying cause may be flooring that was too moist at installation (see above), or operating the heat at a higher than recommended temperature. In the gapped wood floor over radiant tubing shown here, the owner, attempting to eliminate a smell associated with the radiant heat tubing, ran the heating system at high temperature, perhaps contributing to this floor gap problem. The floors I need help with have loose boards, gap at the top step tread and the house doesn't have air conditioning. The floors were laid in 1939. Would subflooring have been laid this long ago and is that why there are loose boards and is very squeaky in places? No pet stains, no dark spots should I sand or just fill with sawdust slurry and oil. [Click to enlarge any image] Shown at left, an older wood floor in Rockefeller Hall, Vassar College - DF. Reply: use sawdust to fill wood floor gaps? Nick I'm unclear on what we're discussing here, so can only make some guesses. 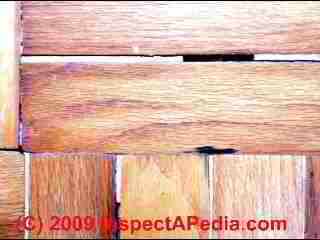 By 1939 many homes had wood floors installed over wood subfloor - the way to find out is to examine both sides of the floor, but one can also often infer or guess or discover the floor structure just from the top surface by noticing the floor type (wideboard vs. newer solid oak or pine narrow board flooring) and by probing gaps between floor boards to see if a subfloor is encountered. The 19th century wideboard pine floor shown below was installed directly to joists. I would not fill gaps in wood flooring with sawdust and oil nor anything else, both because I'm uncertain about odor and fire safety issues from the mixture you describe and because gaps in wood floors vary in width seasonally as temperatures and moisture change. Filling gaps between wood floor boards invites later buckling or causes further compression of the edges of boards when they next expand. You can see that's what's been happening with the putty-filled wood floor gaps in photo at left. See GAPS BETWEEN FLOOR BOARDS for details. Thanks. I will examine the underneath and see if there is subflooring. They are very squeaky in some places. Can I nail down the squeaky areas? I saw the sawdust on a Youtube video. This is my first DIY project, do you suggest hand sanding? I also saw cleaning the floors with vinegar. The finished stain color is ideal. I don't want to do too much and ruin them. Your thoughts. Squeaky wood floors are caused by movement in one or more boards that rub together as you walk over them or as building temperatures and moisture level change. Ideally we repair loose wood flooring by screwing up or nailing-up from beneath the floor, through the subflooring or best on an angle through the floor joists, through the subfloor (if present) and into the bottom of the finish flooring above. Nick, at LOOSE NOISY FLOOR REPAIR I've collected a complete set of steps for repairing loose or noisy wood flooring working from above or from below depending on the situation. About hand sanding versus power sanding, the answer is, as Mark Cramer says, ... it depends. On a hardwood floor with plenty of wood thickness and deep damage we might use a power sander along with an edger. On an antique (often soft-wood) floor like the one shown at left we use a combination of sharp hand scrapers and hand sanding. In my opinion sanding an antique or historic floor dead flat produces a weird and inappropriate finish. In general using the least destructive, least invasive method is best. See MOLD CLEANUP - WOOD FLOORING where we describe removing mold from wood flooring surfaces. Cleaning mold from wood framing, or wood building sheathing and similar wood surfaces is discussed at MOLD CLEANUP - WOOD FRAMING & PLYWOOD. 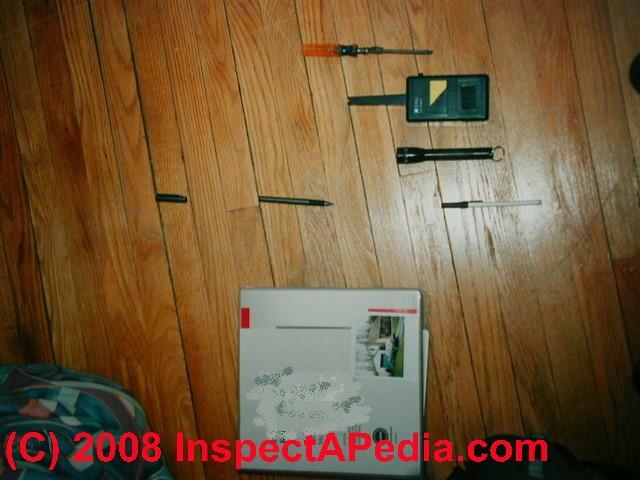 Also see HIDDEN MOLD in FLOOR / SUB-FLOOR. and see MOLD GROWTH on SURFACES for an index of what mold genera/species are frequently found on various building surfaces and materials. 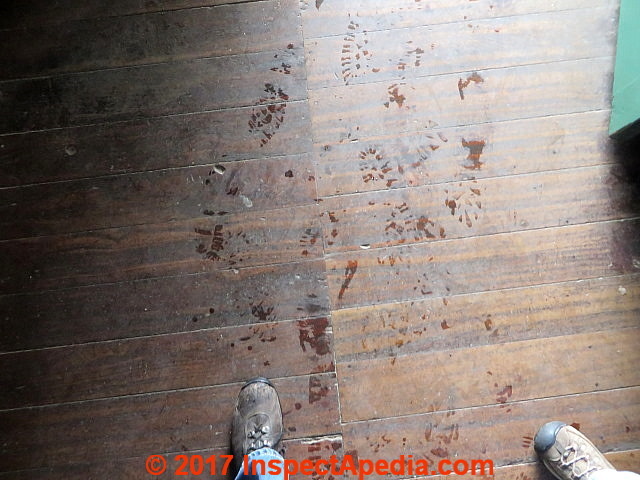 The owner of a building wants to know why this room smells from maple syrup, the odor is stronger when humidity is high, the wood is maple wood and those blotches seen is not understood, it’s a 100 year old building. I have not come across mold that smells like maple syrup, though consumption of fenugreek as well as other sources have been associated with that odor in buildings. Sweet odors have also been traced to bedbug infestations or cockroach infestations (NYC DOH). Bees making a colony in a building wall can also be a source of waxy pungent odors. And a few readers have even described sewer gases as "sweet". If the building is framed with cavity walls (not solid masonry) and more if occupants have noticed bees in the area I'd look for a bees nest independent of the apparent rot and fungal decay marks on the floor. Some insecticides or other chemicals applied indoors (perhaps a DIY attempt at mold "treatment") also give off sweet pungent smells. Indoor building mold contamination itself is not generally described as making sweet odor but there is indeed such a huge range of mold genera species that no one should assert the presence or absence of a particular odor as mold-related just based on "opinion". There is even a fungus that produces MVOCs that smell like dirty socks. The stains on the floor look to me like a mix of wood rot and fungal damage that may have been sanded (without repair) and even re-finished. I add that without an onsite inspection or a physical sample of the light yellow material seen in the flooring gaps I can't say if the material is fungal remains or wood filler (perhaps used to fill in worse rot areas). It's no surprise that a 100 year old building may have had heating system leaks or other leaks into the floor cavity and floor rot (wood rot is itself a fungal and bacterial action). It's not unheard-of to come across a floor that was re-finished by sanding over rot, filling a few bad spots with wood putty, and coating the new floor. A close visual inspection that shows that these discolorations were sanded flush and coated-over would argue convincingly for this history. The pattern of the light yellow material is very strongly suggestive of having filled gaps and areas of rot or other damage with a wood filler product that was then sanded. It is not laid-out in a typical fungal growth pattern. The pattern of the dark stains could be rot left in place, or other damage at which the surface was concave and not sanded off during floor re-finishing. I speculate that this is a water-damaged, rotted floor that was sanded and re-finished without pulling up damaged flooring and without cleaning the area below. Pet urine stains on wood floors - pet stains can ruin wood flooring. Stains are deep enough into the wood that almost no amount of sanding will remove them. We have had some wood floor stain removal success by careful, by-hand bleaching combined with sanding, followed by careful blending of hand-mixed wood stain products to return the color of the wood floor section to that of its neighbors. 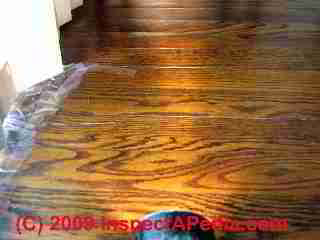 Where small black stains developed in a wood floor in a 1920's bungalow that we restored (our lab and office) we had great success by combining sanding with spot bleach using a Q-tip to lighten the black spots where in prior years moisture had caused bleed and corrosion staining around those fasteners. Any exposed nails were set into the flooring before sanding. After sanding we sat with a Q-tip and a damp cloth, dabbing and bleaching black spots, wiping and washing off the bleach when the stain was light enough - thus avoiding over-bleaching the floor. We mixed wood stain products to bring the color of the stained-bleached spots back to the surrounding flooring. See PET STAINS & MARKS in BUILDING for details including on removing stains from flooring left in place. It is always smart to use the least-invasive, least-destructive repair or renovation method you can. Floor boards that have been stained, gouged, scratched can often be repaired in place. Here is a long strip solid oak wood floor that's shows ugly but fairly superficial scratches. To make this 1970's strip oak wood floor look perfect, sanding and re-finishing may be necessary. But an alternative to try first is thorough cleaning, perhaps buffing with steel wool, followed by application of a sealant and finish coating. Often superficial scratches in a wood floor disappear from view when the scratched finish coating is restored. It's usually a better practice to repair a floor with the least aggressive means possible, preserving the material for a longer life. At WOOD FLOOR ENGINEERED, REPAIRS we include research, procedures, and products to repair gouged and scratched hardwood and engineered wood floors. Several of the types of flooring damage discussed above, beginning at BUCKLED WOOD FLOORING due to leaks or high moisture, describe water or moisture damage to floors. Stains, gaps, buckling, warping and mold are all water-related or moisture-related problems in flooring systems. At LAMINATE FLOOR DAMAGE REPAIR we add another flooring damage example provided by a reader who included photos of what appears to be a water or solvent-damaged laminted flooring product, probably plastic, not wood. Continue reading at FLOOR, WOOD MOISTURE or select a topic from closely-related articles below, or see our complete INDEX to RELATED ARTICLES below. 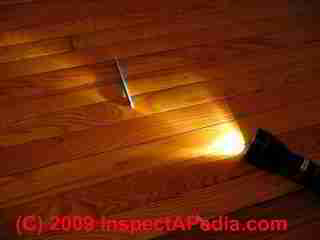 WOOD FLOOR DAMAGE REPAIR at InspectApedia.com - online encyclopedia of building & environmental inspection, testing, diagnosis, repair, & problem prevention advice. What roles did community planning, zoning, and interior design play in how neighborhoods worked? Isham: "An Example of Colonial Paneling", Norman Morrison Isham, The Metropolitan Museum of Art Bulletin, Vol. 6, No. 5 (May, 1911), pp. 112-116, available by JSTOR. Manufactured & Modular Homes: Modular Building Systems Association, MBSA, modularhousing.com, is a trade association promoting and providing links to contact modular builders in North America. Also see the Manufactured Home Owners Association, MHOAA, at www.mhoaa.us. The Manufactured Home Owners Association of America is a National Organization dedicated to the protection of the rights of all people living in Manufactured Housing in the United States. Pergo AB, division of Perstorp AB, is a Swedish manufacturer or modern laminate flooring products. Information about the U.S. company can be found at http://www.pergo.com where we obtained historical data used in our discussion of the age of flooring materials in buildings.